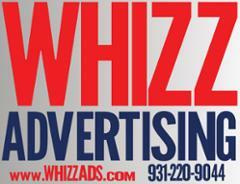 Whizz Ads provide "A Captive Audience" to promote your business to thousands of people in Clarksville, Tennessee and Hopkinsville and Oak Grove, Kentucky. We can guarantee that thousands of people will see your full color page ads - who else can say that? For the most cost effective advertising that is where people want something to read! Our ads can be seen in restaurants, night spots, fitness centers, family centers, event centers, coffee shops and golf courses. We are where your potential clients are spending money and they have 3 to 5 minutes to see about YOUR business!